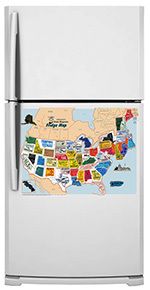 This magnetic State Magnets USA Map Collector’s Board is 18x24 inches in size and made of solid, sturdy metal. You can buy our state magnets collector's board separately with no magnets, or you can purchase it with sets of 52 state magnets OR 65 magnets that include all 50 US states, Washington DC, Puerto Rico plus the Canadian provinces. Please note that the collector's board is not a puzzle. It fits the 2.5 square inch, 2 color state magnets available on our site and offered in gift shops across the US. *Ships within the continental United States only.